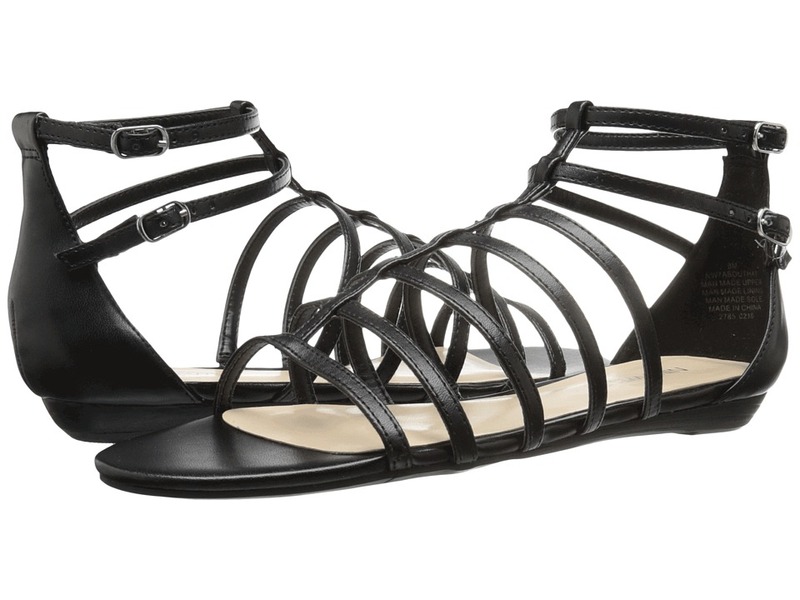 Embrace an alluring silhouette with the Nine West Aboutthat gladiator sandal. Man-made upper. Dual buckle closures at ankle. Open toe. Gladiator silhouette. Man-made lining. Lightly padded footbed. Man-made outsole. Imported. Measurements: Heel Height: 3 4 in Weight: 6 oz Shaft: 4 1 4 in Product measurements were taken using size 8, width M. Please note that measurements may vary by size. Weight of footwear is based on a single item, not a pair. Click The Lucchese Bootmaker Patsy blends a sleek, feminine silhouette with a rugged leather construction that will easily appeal to your cowgirl spirit and style. 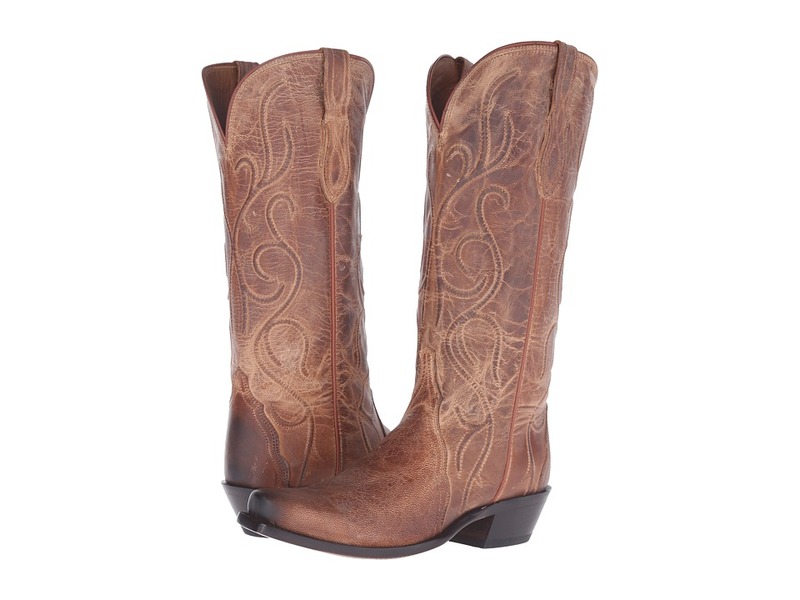 Genuine leather upper with intricate distressed detail for a vintage look. Western stitching on shaft. Side pull-on straps for easy entry. Smooth leather lining. Cushioned leather insole for all-day comfort. Durable leather outsole with rubber heel tab for added traction. No other boot fits the human foot like a Lucchese boot, thanks to Lucchese~s original design, meticulous construction, and cushion comfort insole. Handcrafted in Leon, Mexico, the boot making capital of the world, combining the finest leathers available throughout the world. Measurements: Heel Height: 1 3 4 in Weight: 1 lb 4 oz Circumference: 13 1 4 in Shaft: 13 1 2 in Product measurements were taken using size 7.5, width B - Medium. Please note that measurements may vary by size. Weight of footwear is based on a single item, not a pair. The Nine West Nora is the go to heel for any occasion both casual and professional. Available in a variety of leather uppers. Adjustable buckle closure at ankle. Open toe silhouette. Man-made lining. Lightly-padded footbed. Wrapped block heel. Synthetic outsole. Imported. Measurements: Heel Height: 3 1 4 in Weight: 9 oz Product measurements were taken using size 8.5, width M. Please note that measurements may vary by size. Weight of footwear is based on a single item, not a pair. Embrace the fierce, feminine style of the Feather Fringe Necklace/Earrings Set from MF Western! Necklace: Single silver-tone metal chain. 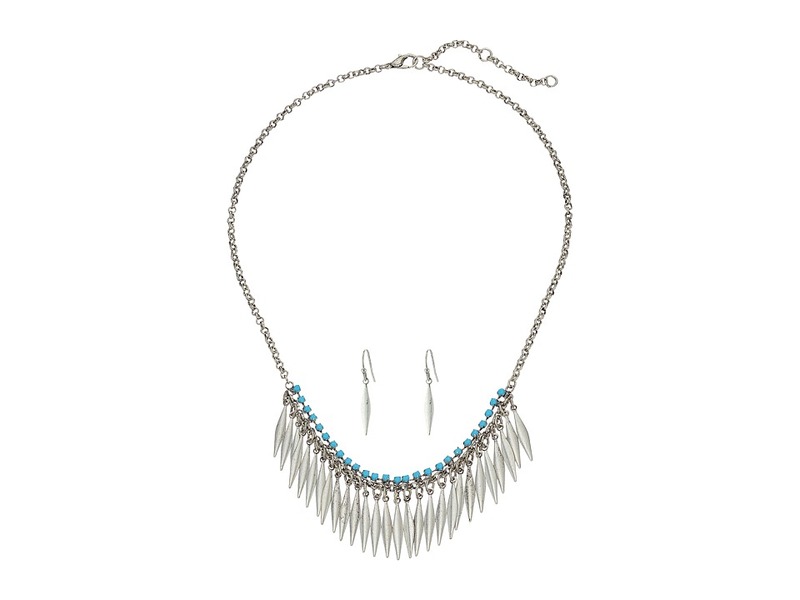 Features a silver-tone fringe with turquoise stones. Silver-tone lobster claw closure. &amp#8226 Circumference: 17 in. &amp#8226 Extended Length: 2 in. &amp#8226 Pendant Height: 1 in. &amp#8226 Pendant Width: 4.3 in. &amp#8226 Weight: 0.6 oz. Earrings: Silver-tone drop earrings. Hook backing. &amp#8226 Height: 1.0 in. &amp#8226 Width: 0.12 in. &amp#8226 Weight: 0.1 oz. Imported. Be admired for your trendsetting style in the Nine West Hollison pump. Leather or suede upper. Ankle strap with buckle closure. Round toe. T-strap design with bow detail. Man-made lining. Lightly padded footbed. Wrapped heel. Man-made sole. Imported. Measurements: Heel Height: 3 1 4 in Weight: 9 oz Product measurements were taken using size 7.5, width M. Please note that measurements may vary by size. Weight of footwear is based on a single item, not a pair. Dress up your modern look and garner compliments in the Maisie peep toe pump. Suede upper. Wraparound ankle strap with tie-up closure. Peep-toe silhouette. 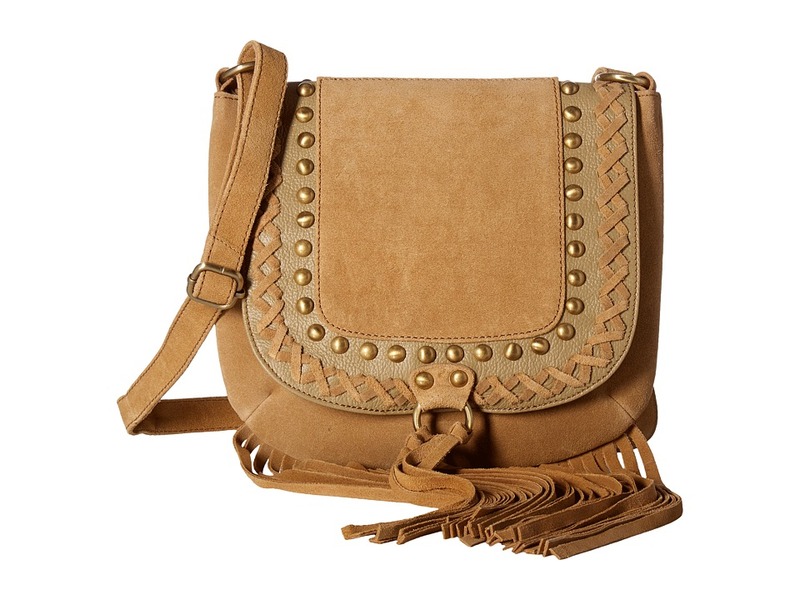 Tassel and cut out details. Man-made lining. Lightly padded footbed. Stacked stiletto heel. Man-made sole. Imported. Measurements: Heel Height: 4 in Weight: 8 oz Product measurements were taken using size 8, width M. Please note that measurements may vary by size. Weight of footwear is based on a single item, not a pair. 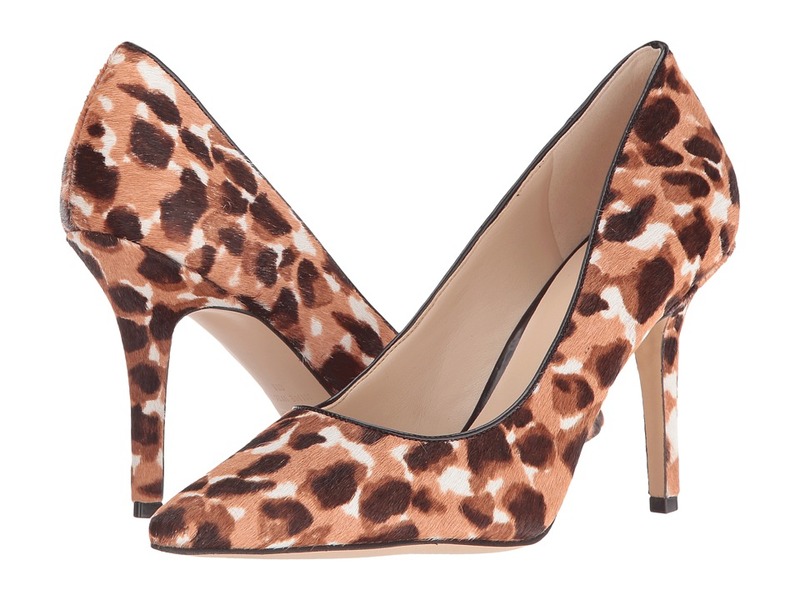 Bring a modern elegance to your ensemble in the Nine West Melliah pump. Suede upper. Slip-on design. Pointed-toe silhouette. Bow accent at side. Man-made lining. Padded footbed. Wrapped heel. Man-made sole. Imported. Measurements: Heel Height: 3 in Weight: 9 oz Product measurements were taken using size 9, width M. Please note that measurements may vary by size. Weight of footwear is based on a single item, not a pair. The floral details lend a feminine aesthetic to the ultra-chic Oakima pump. Slip-on design. Suede upper. Padded footbed. Pointed toe. Floral textile detail at vamp. Covered stiletto heel. Man-made lining. Man-made sole. Measurements: Heel Height: 4 in Weight: 9 oz Product measurements were taken using size 8.5, width M. Please note that measurements may vary by size. Weight of footwear is based on a single item, not a pair. 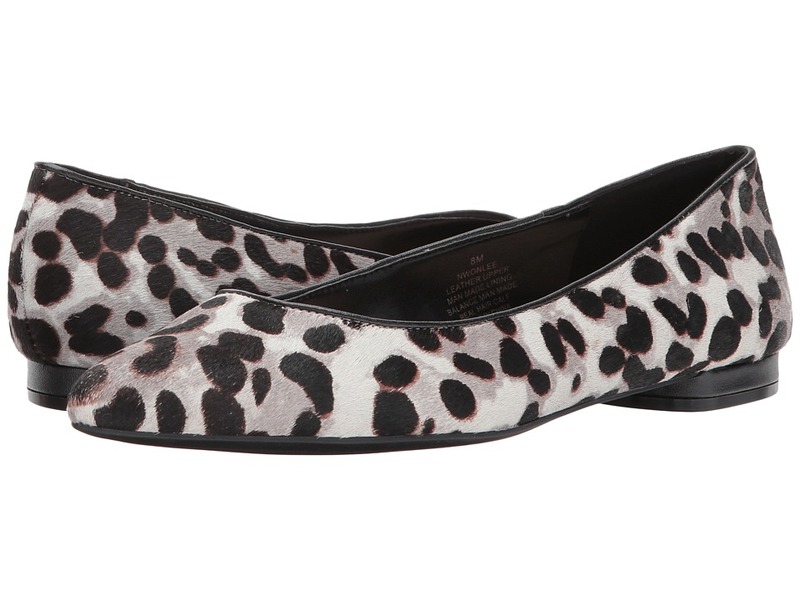 Be exotic every season with this Nine West ballet flat. Patterned calfhair upper. Easy slip-on wear. Pointed toe. Man-made lining. Lightly-padded footbed. Flat heel. Synthetic outsole. Imported. Real cow fur. Artificially dyed and treated. Origin of fur: China. Measurements: Heel Height: 1 2 in Weight: 6 oz Product measurements were taken using size 7.5, width M. Please note that measurements may vary by size. Weight of footwear is based on a single item, not a pair. 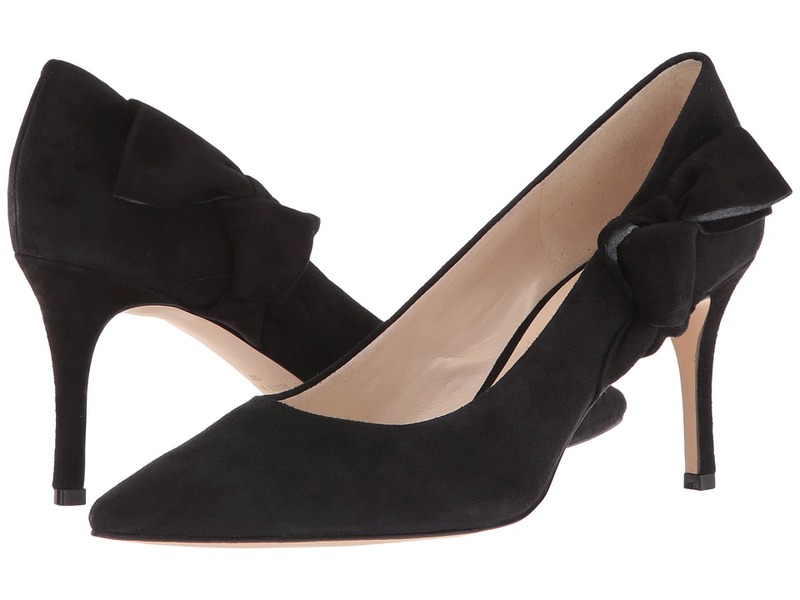 The Brielyn is the contemporary pump you need for your sophisticated lifestyle. Available in a variety of leather uppers. Easy slip-on wear. Almond toe. Man-made lining. Lightly-padded footbed. Wrapped stiletto heel. Synthetic outsole. Imported. Measurements: Heel Height: 4 1 4 in Weight: 11 oz Platform Height: 1 2 in Product measurements were taken using size 7.5, width M. Please note that measurements may vary by size. Weight of footwear is based on a single item, not a pair. The Nine West Crossroad sandals flaunt a fun and flirty metallic heel. Available in a variety of uppers. Ankle strap with a buckle closure. Open toe. Man-made lining. Lightly-padded footbed. Contoured, metallic, chunk heel. Synthetic outsole. Imported. Measurements: Heel Height: 3 1 2 in Weight: 9 oz Product measurements were taken using size 8.5, width M. Please note that measurements may vary by size. Weight of footwear is based on a single item, not a pair. A classic Levi~s look that~s sure to be a wardrobe staple! 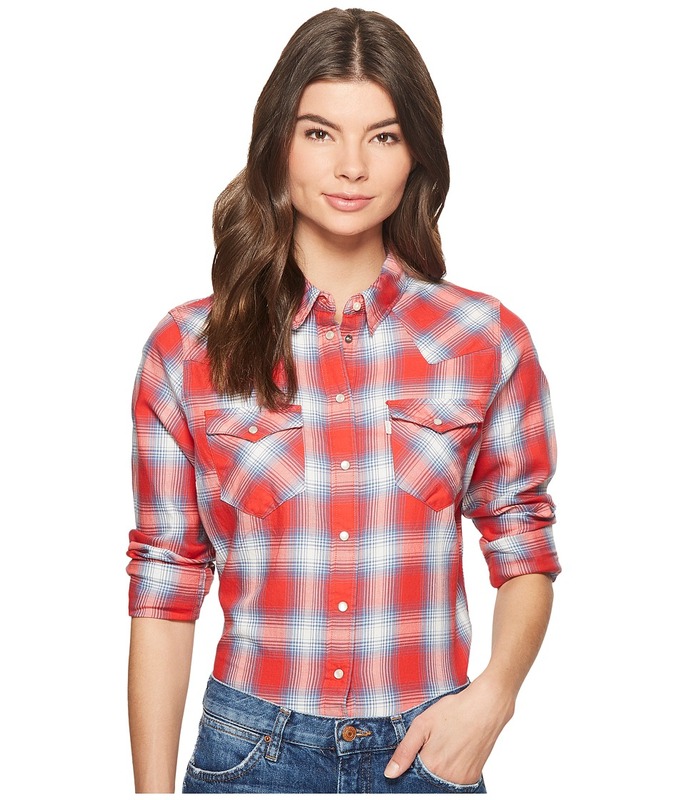 Long-sleeve western shirt boasts a classic cut and slim fit contoured at the waist. Lightweight cotton twill is perfect for layering on cooler days. Pearlized snap closures add a feminine touch. Point collar. Pointed front and back yokes. Pointed snap-flap chest pockets. Branded tag detail. Long sleeves finished with triple-snap cuffs. Front snap closure. Rounded shirttail hemline. 100 percent cotton. Machine wash cold, tumble dry low. Imported. Measurements: Length: 25 in Product measurements were taken using size SM. Please note that measurements may vary by size. Dare to be noticed for your bold look in the Nine West Bree bootie. Leather upper. Lace-up design. Open toe. Man-made lining. Lightly padded footbed. Stacked block heel. Man-made sole. Imported. Measurements: Heel Height: 3 1 2 in Weight: 13 oz Product measurements were taken using size 10, width M. Please note that measurements may vary by size. Weight of footwear is based on a single item, not a pair. The simply stylish and very feminine look of the Durango Crush Embossed Bootie will make a perfect addition to your cowgirl look. Premium full grain leather upper. Features a beautiful all-over floral embossing. 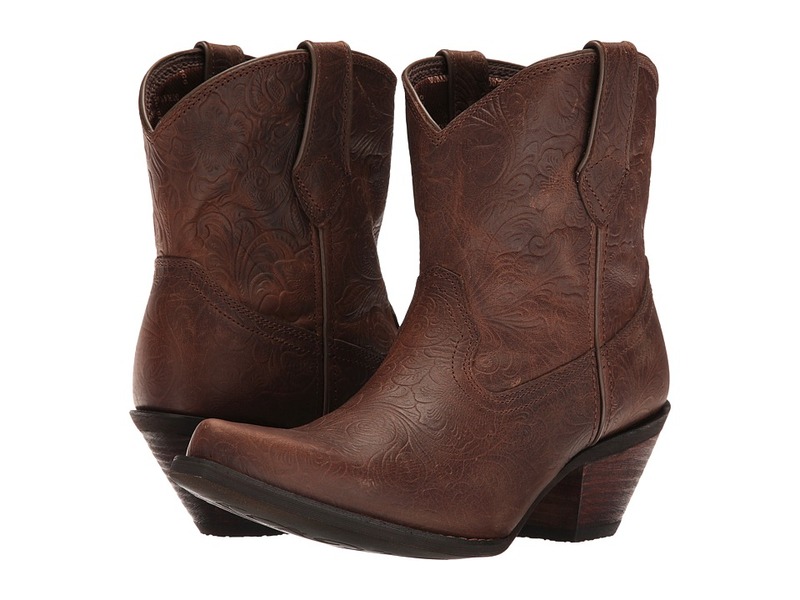 Easy pull-on bootie with sturdy leather side pull loops. Snip toe design. Soft, breathable mesh lining. Cushioned and flexible insole. Tempered steel shank for added support. Lightweight construction. Long-lasting rubber outsole with a smooth filigree finish. Imported. Measurements: Heel Height: 2 in Weight: 1 lb 3 oz Circumference: 13 in Shaft: 8 in Product measurements were taken using size 8.5, width B - Medium. Please note that measurements may vary by size. Weight of footwear is based on a single item, not a pair. Perfect your boho-chic ensemble this season in the Nine West Kanti sandal. Suede upper. Lace-up design. Open toe. Caged silhouette. Man-made lining. Lightly padded footbed. Wrapped block heel. Man-made sole. Imported. Measurements: Heel Height: 4 in Weight: 11 oz Shaft: 6 3 4 in Platform Height: 1 2 in Product measurements were taken using size 8, width M. Please note that measurements may vary by size. Weight of footwear is based on a single item, not a pair. 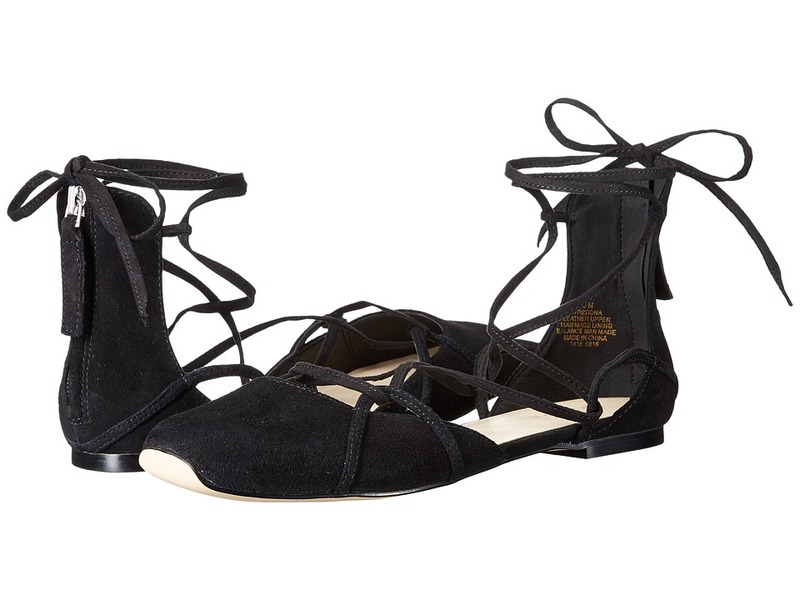 Celebrate your graceful style in the ballet-inspired Zoona flat. Suede or textile upper. Back-zip closure. Soft, square toe. Lace-up vamp with ankle tie. Man-made lining. Lightly padded footbed. Man-made sole. Imported. Measurements: Heel Height: 1 4 in Weight: 7 oz Product measurements were taken using size 8, width M. Please note that measurements may vary by size. Weight of footwear is based on a single item, not a pair.